The coin belongs to a set of four - two silver and two golden coins - celebrating 2050 years since the political union of the Dacians into a single state, meant to be struck in 1983 on August 23rd, the Romanian national day of the time. The set was struck at the Franklin Mint in Philadelphia (United States of America). Trustful sources assume 6.500 pieces but others raise the number to 7.500. Anyway, it is very rare. The silver coins of the same series can be seen on the previous pages. Another golden coin of the same series can be seen on the next page. For almost 40 years, since the TRANSYLVANIA OF OURS coin in 1944, Romania had not struck gold when this set appeared. A very peculiar information was provided to us by the anonymous donor of the pictures. The 50 lei and 1000 lei coins from this series were only minted in 1983. They are a one year type. The 100 lei and 500 lei coins were minted in 1982 and 1983. In some cases the 1982 coins were sold together as a set instead of individually. Moreover, there is another interesting bit of information about this series. Besides the regular 1983 coins, the Franklin Mint issued a special limited edition set (also 1983) with a serial number engraved on the side of each of the four coin. The Franklin mint only made 1000 of these limited edition sets. We could easily deem that not less than ten different pieces must be acquired to have an exhaustive collection. 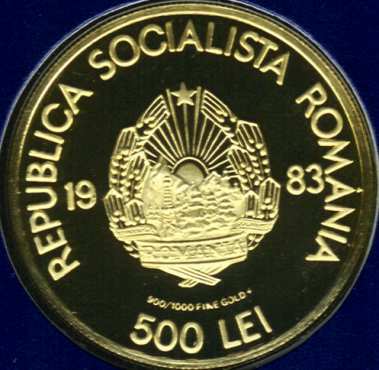 The golden pieces of the set have underneath the coat of arms of the Socialist Republic of Romania, after the title 900/1000 FINE GOLD a special sign that resembles an F that could easily stand for the Franklin mint that issued them. A similar ensign exists also on the silver coins, only much larger and easier to perceive. As you have previously read, three tiny Dacian flags are pictured on the reverse. As it is very likely not to know how a Dacian flag looks like, it is fit to point out that such an oriflame is comprised of a (natural, 3D shaped) wolf head to which a scaly, serpent or dragon tail is attached. A very original and, why not, gruesome ensign indeed. These four distinctive homage coins are not the only having Dacia and the Dacians as subject. 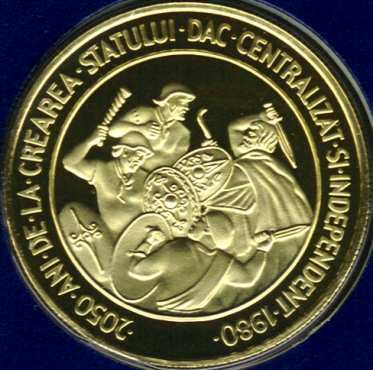 In 2001 Romania struck a large gold coin of 1000 lei to mark 1900 years since the first war between the Romans and the Dacians started (101 -102 A.D.) in the times of king Decebal. Click here to see it. The 2050 years since the creation of the centralized and independent Dacian state were also celebrated through philatelic issues. Here is one picturing its leader, great king Burebista. 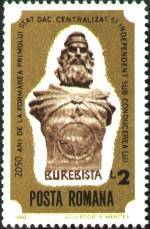 Burebista was considered by his contemporaries as "the first and the greatest among the kings in Thrace". He mastered "all counties from thither and hither of Danube", as an inscription in Greek found at Dionysopolis (today Balcic, Bulgaria) informs us. During his reign the Dacian state reached its climax, being feared even by the Romans. Burebista wage many wars, all victorious. His state stretched from the Black Sea and river Bug over to nowadays Bohemia and from Haemus - Balkan Mountains over to the Woody Carpathians. In 44 B.C. Burebista was murdered and his state divided among the conspirators. There is an opinion according to which one of those was Koson, the one striking the famous gold coins bearing his name.